Alienware is famous for two things. One: selling ever more powerful gaming computers. Two: making them look like they were designed by aliens. But its latest full-size desktop gaming PC isn't just another box sculpted to look like it's out of this world. 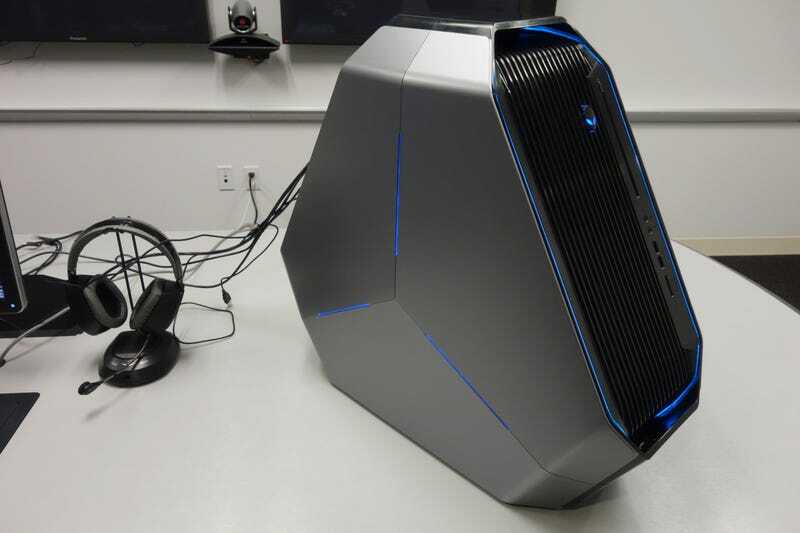 In fact, the new Alienware Area-51 is trying to challenge the assumption that PC gamers need a "box" at all. Three years ago, Alienware decided to figure out how people actually use desktop towers at home. Usually, the answer was tucking them away under a desk, creating chiropractic nightmares. "It's pretty uncomfortable to interface with the system if you have look under the desk and try to find the port," says Alienware boss Frank Azor. "And if you wanted to plug something into the back of your desktop, that was a mission all its own." But Azor asserts that the new Area-51, with its 22-inch tall triangular-hexagonal body, which they call a Triad chassis, cuts down on back-breaking incursions into the shadowy PC underworld. The cabinet's front sloping interface offers easy access to USB ports and headphone jacks, and better still, the entire chassis can also be pulled forward, pivoting on its front edge, to help plug in cables and additional devices on the back. The back also includes LEDs to light up the rear panel so you can actually see what you're doing. The new design also minds the gap, specifically between the wall and the computer, to help create what the Alienware engineers call "a controlled thermal exhaust." Basically, as a triangle, it's pretty impossible to have the back vents pushed up right against the wall compared to a traditional setup. The tower (can we still call it that?) is even easier to transport because of the built-in handles in each corner and the tilt-friendly design. LAN parties just became much, much easier, assuming you can manage its 45-lb bulkiness. But despite the triangular configuration, the Area-51 finds room to pack in plenty of premium hardware. Two giant, quick-release interchangeable side panels allow access to every inch of the computer, and it can fit in some serious horsepower: The particular setup I saw ran three NVIDIA GeForce GTX 780s running Assassin's Creed IV: Black Flag at 45 fps at a gorgeous 4K resolution. On the CPU side, Area-51 supports Intel's new six- and eight-core (!) Haswell-E series processors, and both overclocking and liquid cooling will come standard. There's room for up to 32GB of DDR4 memory, bays for up to three full-size hard drives and two solid state drives, and an optional 1.5-kilowatt modular power supply to feed all the components you add. While almost all the specs are customizable and upgradeable (as you'd expect from a high-powered gaming rig), you'll also find that high-speed 802.11ac Wi-Fi and Killer Gigabit Ethernet come standard. For the creative decorator inside all of us, the chassis also has nine separate lighting zones that can be changed to one of 20 different colors. You control them Alienware's proprietary Control Center app, which also now lets you fine-tune settings, overclock processors from within Windows, and even create widgets to keep track of your PC's performance while doing other tasks. Alienware is still working out pricing and availability for the Area-51, but you can probably expect to pay multiple thousands of dollars when units begin shipping in October in the US and globally this holiday season. It won't be the only outlandish-yet-impressive new product from the company during that timeframe. Alienware is displaying an experimental spirit recently with several new gaming PC options, including a slim new 13-inch laptop and the relatively inexpensive Alienware Alpha console. But if you want Alienware's new flagship, the future is a triangle.